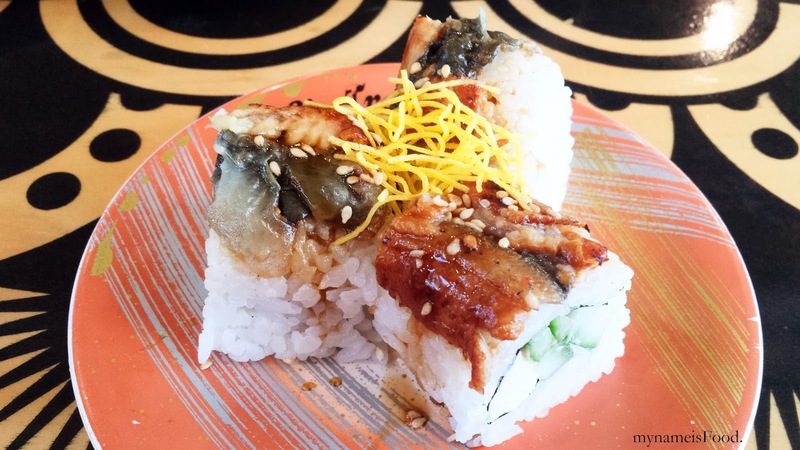 Sushi Train, Westfield Chermside, Brisbane - my name is Food. Sometimes it may take them for a while to get you seats when it starts getting busy. Service has gone down and has became worse and worse from the previous experiences. I find it quite shocking when you ask for "Ocha" at a Japanese eatery and the waiters replies "What?... What?.. Och what?.... Oh, Green tea?". 'Ocha' is a very common word used and in Japanese restaurants, even if the waiters are not Japanese, I would expect them to know basic Japanese food words.. Just disappointing..
'Dragon Roll' ($4.5) was small in portion with little Unagi (eel) on top. What used to be a chunky eel slice, now was just a very thin and what seems to be only the edge or leftover side of the eel. The overall taste was quite bland too. 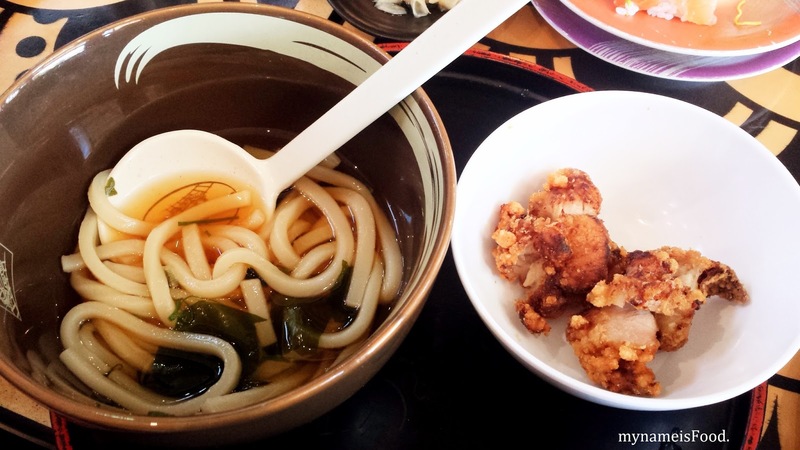 'Mini Udon with Karaage' ($6) was smaller in portion that what it used to be. The Karaage chicken was only given in three or four small size pieces. 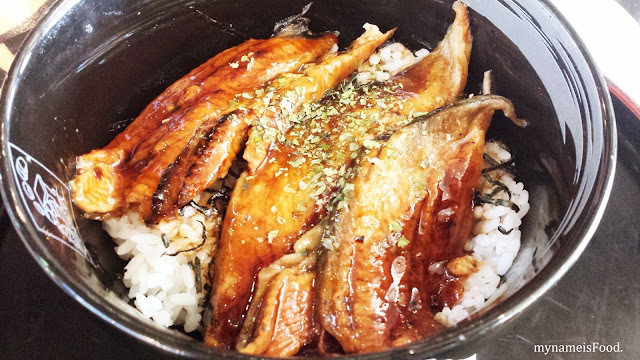 'Grilled Eel Don' ($13.5) was again, small in portion, it used to have so much more rice compared to the amount of eel given, but now it seem to have less rice and the Eel given was 3 slices. 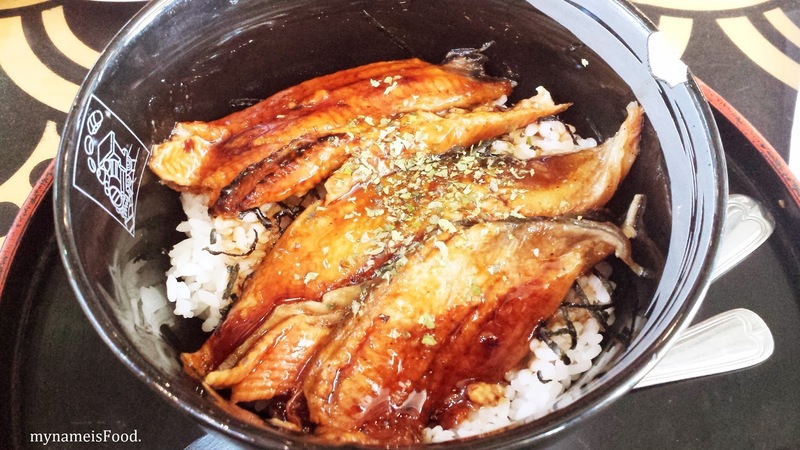 However, the eel was marinated well with the right texture. Another downside was the un-professionalism of the waiters. When diners are eating, it is not nice to have the waiters to continuously disturb you by wandering around or constantly trying to have a look at you while you are eating. Even if the restaurant is not busy, but they could try and find other things to do instead of staring at diners eating. Also, there was one specific waiter that had no manners, she would laugh and giggle with the other waiters, she would give us this tired look everytime we were wanting to order something or ask for a hot water top up for our green tea and what annoyed me the most was how she would put her elbows and lie back on the table that we were sitting on (the booth), simply rude. Copyright© 2018 mynameisFood. | Template Created By : ThemeXpose | All Rights Reserved.